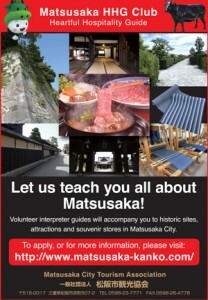 1, Matsusaka HHG Club is a volunteer guide group designed to help foreign tourists enjoy their time in the Matsusaka area. We are not professional tour guides, but our welcoming spirits are above any professional’s. 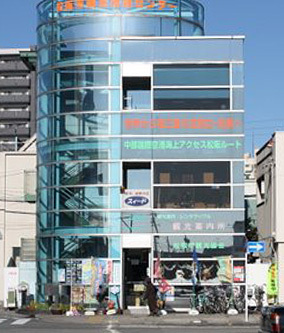 2, Tours are free, but we require a 1,000 yen donation to cover the volunteer guide’s parking fee and transportation costs. Also, you must pay your own transportation fees and entrance fees. 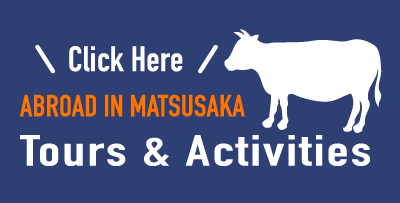 3, Neither the Matsusaka HHG Club nor the volunteer guide are liable for any accidents, illnesses or injuries during the tour. 4, Tour courses are flexible, but please let us know what you would like to see when you apply. Also, please understand that we may not always be able to satisfy all requests. 5, Applications should be submitted by e-mail or fax at least three days prior to the day of your tour. 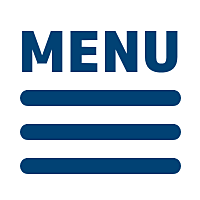 If not, please contact us below by e-mail or fax. 6, Your reservation will be complete once confirmed by a reply from the Matsusaka HHG Club. 7, Your application may not be accepted in some cases. Please understand the items mentioned above before you apply for our guided tour. We will accept any further inquiries and questions.